This one's Haworthia magnifica var. splendens (seed grown, GM447). Is it any wonder that magnifica splendens is among the haws most in demand? Wow! It's been a while...I know. But I have some new photos to post, so here goes! This is a close-up of Haworthia cymbiformis var. obtusa (from seed - JDV96/63). Now that's succulence! Not much today. Spent some of today watering Echeverias and cacti in one of the greenhouses. There should be some nice flower pictures pretty soon. Weather's been beautiful, if a bit chilly at night. 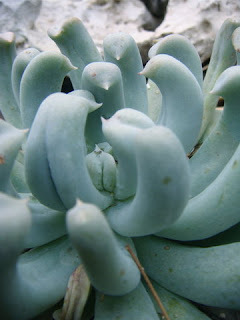 Am preparing to present the program for the Oregon Cactus & Succulent Society (OCSS) Sunday night. The title is "Down & Dirty with Cacti & Succulents" - a hands-in-the-dirt demonstration. OCSS meets at the People's Food Co-op, 3029 SE 21st Ave. in Portland. If you live in the area, come and join us. 4:30 pm. A Central Texas Gardening Blog (East Side Patch) posted this photo noting it's resemblance to a group of penguins in a huddle. What do you think? I was out in the greenhouse today and just had to take a picture of this: Haworthia pygmaea var. argento-maculosa. I just think it's gorgeous. It's grown from seed from Humor Farm. And O how I'm looking forward to Summer! More photos later this week. But, that's past, and things are back to normal -- which means "hectic"! So, back to those promises. I will really, really, really try to live up to them this time. Really!